Expect Battles That Will Stand the Test of Time in the Pokémon TCG: Legendary EX Tin! They are the stuff of legends: Pokémon-EX that will make every battle you experience in the Pokémon Trading Card Game a battle to remember! 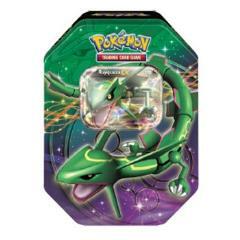 Each Pokémon TCG: Legendary EX Tin contains 1 of 3 powerful Pokémon-EX as a special foil card, plus 4 Pokémon TCG booster packs AND a BONUS code card for the Pokémon Trading Card Game Online. With the Legendary EX Tin, you can become part of the legends! 4 Pokémon TCG: Black & White Series expansion booster packs! A BONUS online code card for the Pokémon Trading Card Game Online!